I just saw all the dresses at his atelier, and I am confident that Pierre's new spring line will change the world. Of course, my opinion is far from objective. I have, after all, known him since he was "Little Pierre Balmain, the Boy with the Iron Fists." Back then, he was just a scrappy 8 year-old boy in the Metro, punching holes in plywood for the amusement of passengers. He survived on the change and baguette ends they'd throw, but he'd always maintained his dignity, and never once did I see his homemade bow-tie soiled or askew. In my mind's eye, I can still see the "Boy with the Iron Fists" sign that he used to prop up next to his donation bucket. What a sad little scrap of cardboard. At first I was sure he made all the "R's" backwards to elicit sympathy, but after talking to him that first day, it became clear that he was lucky to have any of the letters correctly oriented. He had only heard rumors about something called "school" and I believe he thought it was some kind of food. I wasn't much older than him, but I already had a well developed sense of philanthropy, and wanted to help him. We became friends, and during the year I lived in Paris, we spent a great deal of time together. Though my father would complain about all the cats that would follow him into our house, I think he was proud that had I taken on a charity case. 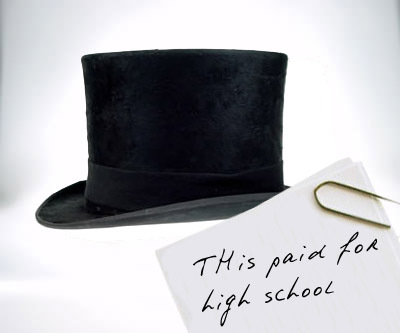 After all, it was father who helped me set up a trust fund for Pierre with the money I got from selling some of my hats. We saw each other less when I moved back to the states, but we kept in touch. Over time, his letters became more and more legible, and talked more and more about making clothes. I encouraged him to follow his passion and financed his initial forays into the fashion business. Obviously, it turned out well. It's been a long time since he's had to punch anything for bread, and I'm sure he never will again.